Think about your average shipping process. It’s probably fairly standard. An order comes through; material is pulled and then palletized. The pallets are then wrapped. Now shipping must generate shipping labels and get the order ready for the carrier. The forklift operator then places one pallet on the scale, gathers the weight, walks over to the shipping terminal and enters the weight. He or she then walks back over to the forklift, removes the pallet from the scale, sets it aside, grabs another pallet, and places it on the scale. 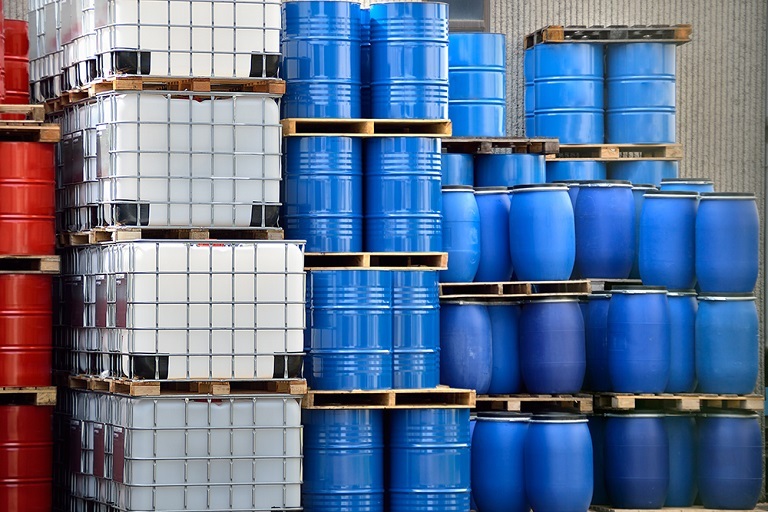 Rinse and repeat until all pallets of the shipment have been entered into the terminal and labels have been printed, allowing for the order to finally be staged for shipping. It doesn’t seem like a lot of steps until you’ve really though it out. And if things were even more complicated? What if there was only one scale and forklift operators had to take turns using it? Imagine the down and lost time. Or maybe you are already very much aware of these issues. What if you had a forklift scale? How would that process look? 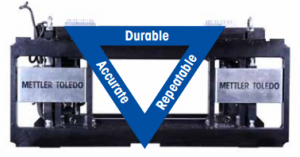 Keep reading and you’ll find out everything the METTLER TOLEDO VFS120 forklift scale can do to minimize the shipping and material transfer processes. As you probably already know, an industrial forklift scale is designed to weigh a load as it is lifted, eliminating the travel time to and from the floor scale. An operator can gather weights from the pallet right where it sits without having to move it anywhere with the mounted terminal inside the forklift cab. 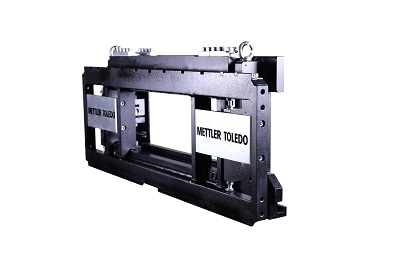 The VFS120 forklift scale is METTLER TOLEDO’s solution to cumbersome warehouse weighing processes. Its simple, yet ingenious 3-Point Suspension Technology allows for easy and quick installation on nearly any fork truck on the market. 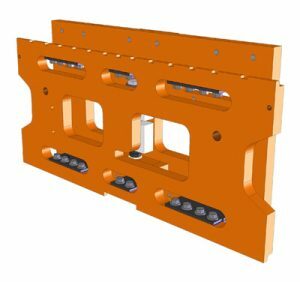 The 3-Point Suspension places the three points and mounting brackets in a triangular fashion, resulting in no other mechanical parts touching the carriage, yet maintaining constant contact with the forklift. The addition of the VFS120 scale won’t be a visual burden on the operator. The center of the scale is wide open, allowing for a clear line of site when the mast is at the height of the cab. 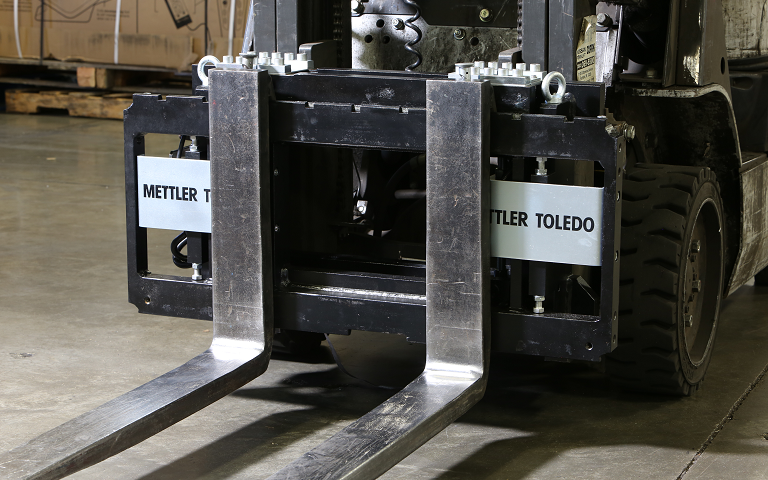 Check out a side-by-side comparison of a typical forklift scale carriage versus the METTLER TOLEDO VFS120! The scale is designed to withstand an overload of up to 150% of the total forklift’s capacity. Since forklifts typically tip in excess of 125% of their capacity, you can take comfort in the scale in knowing the truck is going to tip before the scale is damaged. 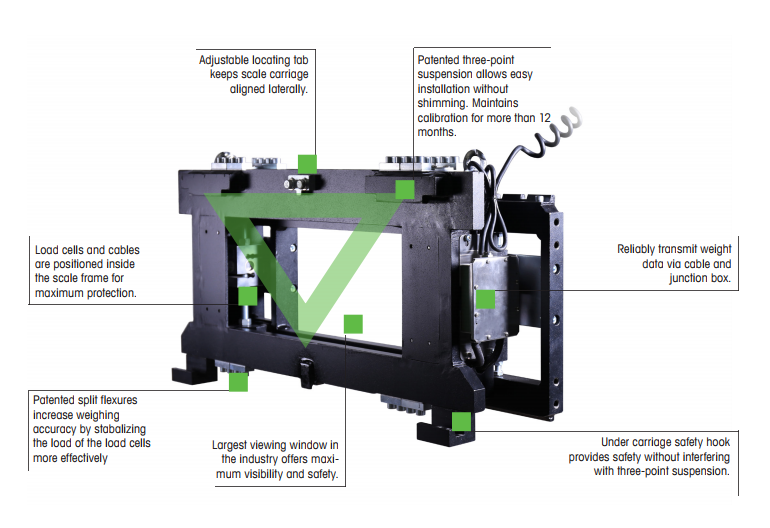 Not only that, but all sensitive components such as load cells and electronics are enclosed in the solid steel carriage, protecting them from damage from nearly any angle. This robust design keeps internal components safe from knocks, bumps, and even crashes (I do not recommend testing this out). The VFS120 was put to the test and subjected to a series of durability experiments. One of the tests involved driving the forklift into the wall at full speed. The impact caused the wheel of the forklift’s mast to break. The scale, however, survived the crash unharmed (okay, but really I want to know what the wall looked like). Located on the side of the weighing carriage sits an angular sensor with an anti-vibration functionality for onboard weighing. This angular sensor is fitted with a complex algorithm to compensate for uneven surfaces to maintain weighing accuracy. Patented split flexures located on the bottom of the carriage work to increase weighing accuracy by stabilizing the load on the load cells more effectively. And if that’s not enough, the vibration of a diesel forklift won’t even affect the advanced filtering processes the scale can filter out. Environmental and forklift vibrations? Check. Did I mention the scale holds calibration for 12 months? Need I say more? 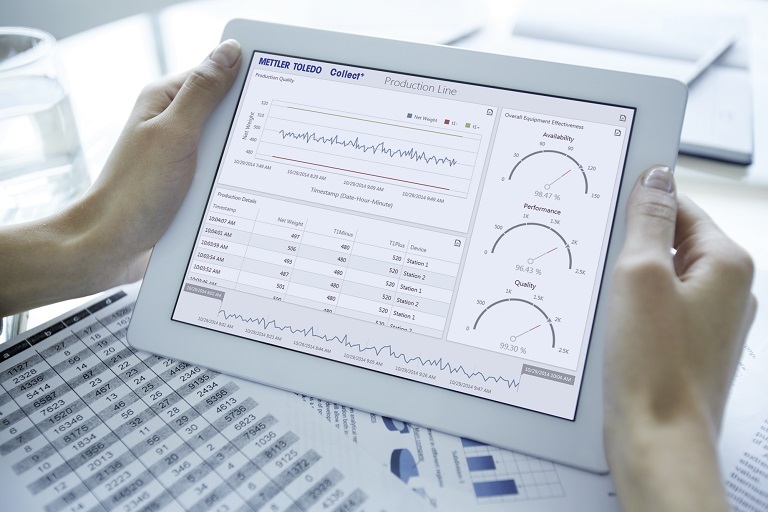 Stay running and prevent downtime by not having to worry about excessive, routine calibration. You betcha. 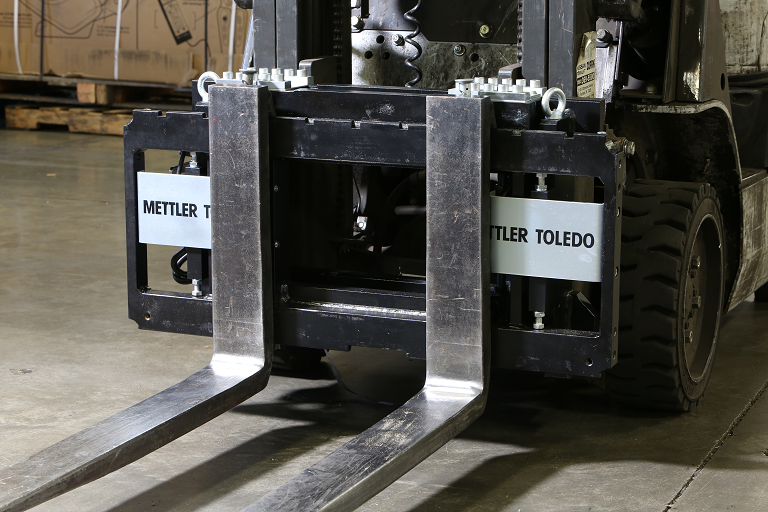 The METTLER TOLEDO VFS120 Scale is approved for Class II forklifts with a Class III NTEP certification. Great, so I can save time and improve efficiency by not having to travel to and from a scale to get my weights. But I’ll still have to record or write down my weights for the shipping terminal and travel to and from there. Well, maybe if you went with another supplier. The VFS120 from METTLER TOLEDO is fitted with IND236-k weighing terminal. The integrated software in this terminal saves a complete transaction record and eliminates the errors and inefficiencies with manual data entry. The weights recorded can be sent to a smart device and even merged with dimensional and ID data via Bluetooth. And if you want to get really fancy and efficient, integrate a Bluetooth barcode scanner and pull weight and product description to a smart PC, program, or even PDA. Scan palletized product information into a database and associate it with a weight without ever relocating the pallet. Now pretend you just got yourself a new METTLER TOLEDO VFS120 forklift scale with a barcode scanner. Now that’s a hard concept to pass up. This scale practically pays for itself in a few short and efficient months. 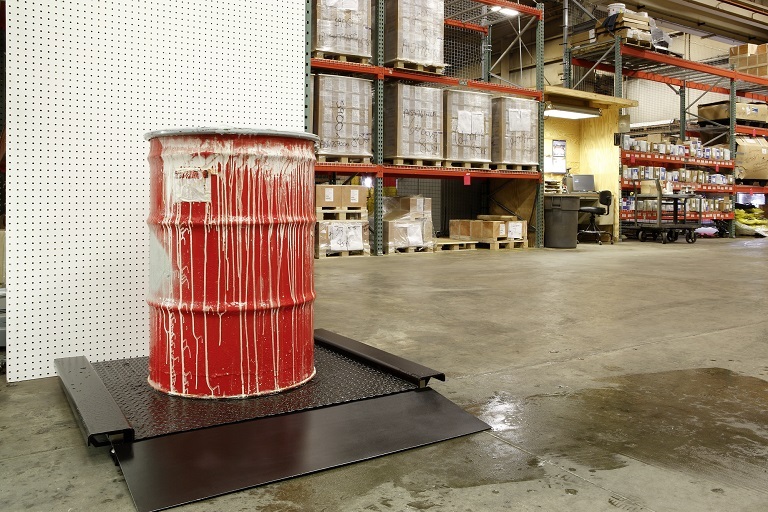 And a forklift scale is just one of many ways to improve efficiency in the warehouse. Well at least for this blog. There are numerous safety features, product specifications, and applications notes that still need to be covered. But we’ll save that for a later time. However, if you’re dying to know more, checkout the product specifications below or get in contact with one of our 5 locations nearest you!